After two months working for an Argentine environmental NGO, I have mixed results. The first few weeks were super exciting: I got to put together a bike-path manifesto, meet the city’s mayor and create a climate change event for 350.org. However, my main public diplomacy project sputtered out when it came to soliciting funds from our donor organization. Turns out (just like most PD efforts everywhere), people are reluctant to throw money at something that doesn’t allow for quantifiable evaluation within a short time frame. Things move a little more slowly down here, especially in regards to the environment. I’ll admit that choosing TV as a medium to influence Argentine attitudes about the environment probably wasn’t the most cost-effective strategy. But this can still be adopted for radio which I spent the last week researching. Turns out there is a US-based NGO that does exactly what my project for Fundacion Biosfera was trying to accomplish with Social Marketing and Entertainment-Education. Check out Media Impact as this is the majority of what they do with Radio (and some TV in Latin America) and am already in touch with them. I’m happy to have worked for awesome boss that I will stay in contact with in order to strengthen Biosfera’s PD strategies and some amazing coworkers and friends that I’ll no doubt be seeing again before I leave Argentina. Tonight, while in the hunt for live music, I stumbled upon this folklore Peña. I was familiar with Peñas from my time in Peru, where most of the “legit” flute and folkorica bands would play. My friend Ali and I peered in the window and upon seeing 6 of our friends rocking out to some 4 part harmonies, we had to go in. 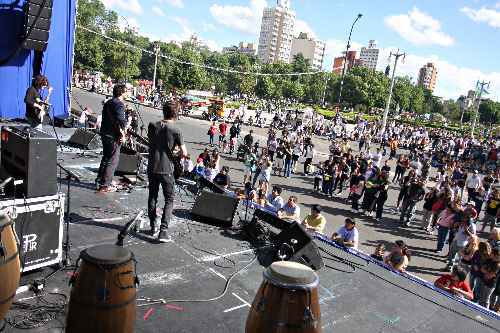 The first group was traditional Argentine folklorica: flutes, lots of drums, guitars and even a xylophone-type instrument. The experience was enhanced by my friends Ihintza and Narua, who broke out their songbook and launched into some folklorica from their Basque homeland. The second group looked like a family project, complete with the weird wacky uncle on bass. They were sloppy to start, but ended up rallying behind their super talented frontman who could play pan pipes, flute, guitar and every other indigenous instrument he could get his hands on. One of my frequent criticisms of bands are the ones that try to cover too many genres within one set, which was exactly what happened here. We had Peruvian flute ballads, Mapuche Andean sonatas, Guaraní galaguetzas, you name it. The venue Salamanca had a great vibe however, very cozy; reminded me of a Native American longhouse, will definitely return before my time here is up.